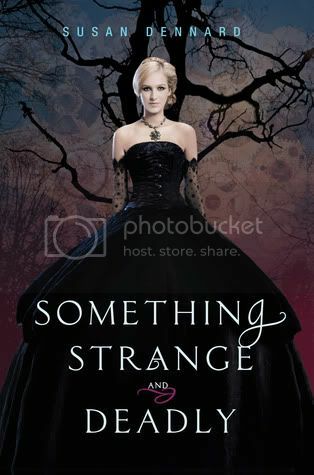 Something Strange and Deadly is an action packed zombie novel by debut author Susan Dennard. The book definitely holds true to its title, it’s full of lots of strange and deadly things that will keep you hooked to the pages and wanting more! Sixteen year old Eleanor Fitt is on a mission to find her brother that has mysteriously gone missing. Along with her search, she’s also dealing with her mother who is trying to marry her off to any rich man that she can find, and also with the zombies that are rising in her town. With the help of a couple of new friends, they must find the person who is responsible for raising the dead, the same person that may also have kidnapped her brother as well. Eleanor was a very interesting character. She was not one to sit around and doing nothing, but she took action in her own hands and did what she had to do. She did not let her fear hold her back while she searched for her brother. She is such a great heroine; these kinds are my absolute favorite. The few times we see her rattled is when Daniel, one of the Spirit-Hunters helping her in her search, left her in mess of confusion. The relationship between Eleanor and Daniel was adorable, and I love that it grew over time, and didn’t happen right away. They make a great team! The secondary characters in the book were engrossing as well. Joseph and Jie, who were also Spirit-Hunters, were each interesting in their own unique ways. The one character that constantly left me in a state of confusion was Clarence Wilcox, would be suitor to Eleanor. I just couldn’t figure him out, and while I didn’t want to like him, I ended up loving him a bit in the end. The thing I liked most about this book is that there is always something going on in it. I read this in one day, which doesn’t happen for me often. I just HAD to know what was going to happen! The world-building was so creative; I loved reading the descriptions of the time period. There was no cliffhanger ending for this book. While there is a build-up for the next novel, the novel was wrapped up nicely, and I definitely had closure at the end. Overall, if you love a good zombie novel, you should definitely check out Something Strange and Deadly. It will not disappoint! I’m itching to get my hands on the next book in this awesome series. I REALLY want to read this one - it's one of the books I've been pining for over the past few weeks! It sounds super good, and I've been recently getting into more historical and zombies, so I should enjoy it! Great review! This looks like a fun read Christy. If it kept you reading 'til the end in one day then it is definitely worth keeping an eye out for! This sounds so great! You definitely have me wanting to read it now. I don't think of myself as a big zombie fan but I like the historical setting and your review makes it sound like a lot of fun. I will be checking it out later this month! A zombie book, hooray! I'm definitely going to be adding this one to my TBR. It sounds so good! Oh, most excellent. *rubs hands together in anticipation* I do love a good, strong heroine who can work through her fear to do what she's gotta do! I'm not a zombie fan, but your review has me interested :) I'll put it on my wish list!! I'm definitely looking forward to this one! Good to hear the secondary characters were great too, that's a plus for me! Fab review, glad you enjoyed this one :). I've seen this book many times, and never once read the summary. Now, I'm glad that I did! I love zombie novels. I seriously wouldn't of guessed that it would have zombies based on the cover.